I grew up playing games like Super Sprint, Super Cars and Ivan ‘Ironman’ Stewart’s Super Off Road and have always been fond of racing little miniature cars around a track. If you’re not quite as old, you may remember the Micro Machines or Death Rally series, or even Rock ‘n Roll Racing for the SNES. And now we have BlazeRush by Targem, which wants to follow in the footsteps of those games with all the features we’ve gotten to know over the four decades that the genre has been around for. 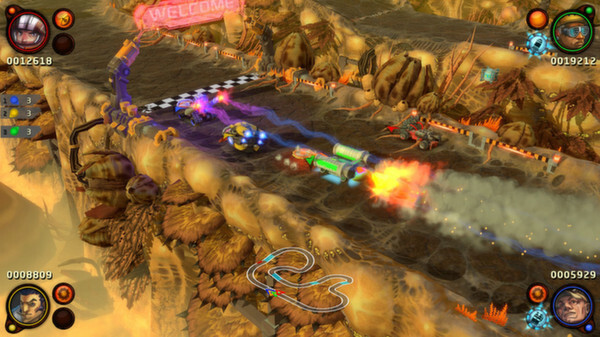 BlazeRush appears to have all the makings of a fun top-down/isometric racer. There’s a good amount of choice between cars, all different in terms of strength, handling and acceleration. There’s plenty of variety in terms of weapons as well, from car-mounted machine guns to saw blades that bounce off the walls and around corners. You’ll also find several ways to boost, from quick jet-fueled boosts to a longer-lasting nitro burn. And to top everything off, the game also features a variety of game modes, ranging from the traditional race format to time trials to last man standing mode with several rounds. Driving this experience, somewhat surprisingly perhaps, is the same engine that you’ll find behind the space MMO Star Conflict – a very different type of game indeed. Despite the game’s old school nature, all the tracks are richly detailed in 3D, and vehicle models are varied enough as well. 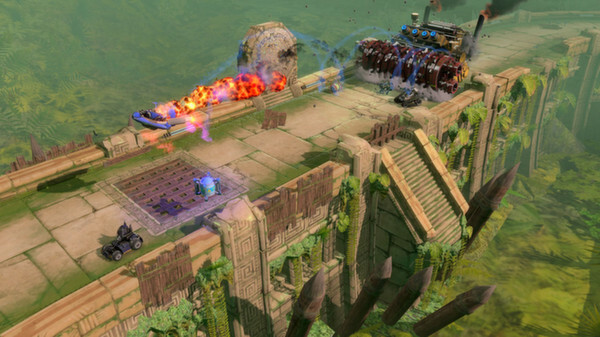 While the game has a career mode that allows you to unlock dozens of tracks and characters, the real heart of the game is in its party mode – which is all about frantic multiplayer races. Playing through BlazeRush’s career mode and throughout the party mode, we had quite a lot of fun. This is the stuff that reminded us of ‘the good old days’, but something about the experience was off. The culprit – the game’s horrible camera work. The power of the game’s engine and the amount of detail in its 3D models allow for the game to smoothly scale in and out during gameplay – but this sometimes makes the screen too cluttered with not enough room to see what’s coming up next. The other big issue with the camera has to do with those moments where you burst away from the pack and build up a lead. For some reason, the game just doesn’t want you to. Not only is there a great deal of catch-up logic at work here, but when you’re the lead car you may very well see your car disappear into the edge of the screen. This is because, for some reason, the camera doesn’t focus on the human player, but on the entire field of racers. This makes a little more sense in multiplayer, but is quite frustrating in single player. Even in multiplayer modes – with the tv sizes we have today – we really would have preferred a split screen mode. Hopefully more camera options will be added in future patches, because BlazeRush has all the building blocks for a really fun new arcade racer. Right now, however, its main issue becomes apparent too frequently and too obviously – which is a real shame since the game’s a lot of fun at its core. If you’re a fan of the genre then you’ll still enjoy this one, but digging up the old Micro Machines games seems like a more appealing alternative right now. We’re hoping for a quick fix to the issues mentioned though, and we’ll update our review if that happens.